My family loves macaroni and cheese. It’s easy to make, tasty to eat, and a simple go-to meal. 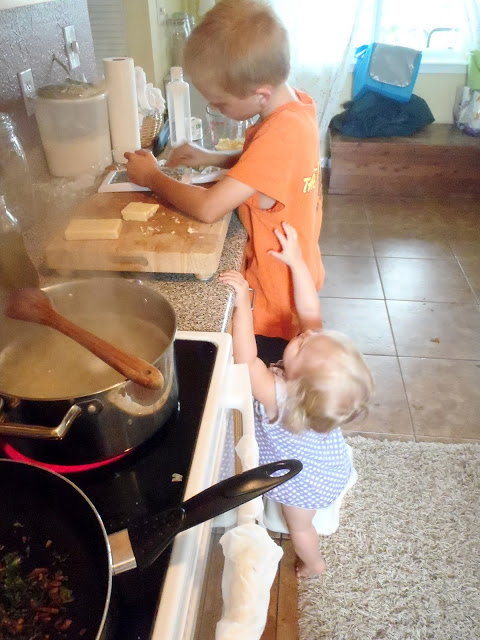 My kids always finish their dinner when I make it, which gives macaroni and cheese bonus points. The only issue I have with it is it gets pretty boring, and I know it is not giving my family the nutrients they need. Pair that issue with collards growing in our garden that I do not know how to use, and you get this recipe. The special cheese it calls for did scare me, but I decided to dive in anyways. Here is my take on it. First, I harvested some collard greens. We have two, what I like to call towers, growing in our front yard. The recipe calls for one pound of greens, which is very easy to find at the grocery store. But here at home, I don’t have a scale and I have no idea what a pound of collard greens looks like. So I just harvested what I thought our collard towers could handle without suffering. I forgot to count, but I think I harvested five or six leaves, which looked like this. 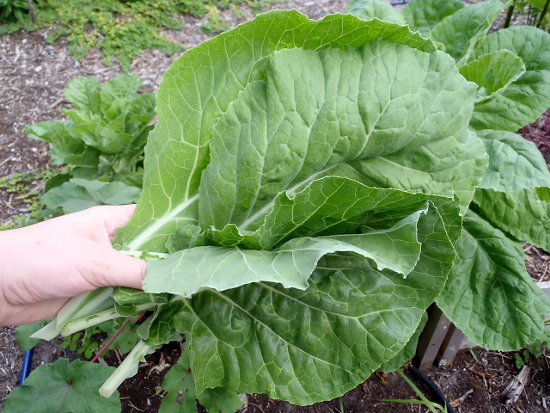 If you are using whole collard leaves like I did, you will need to de-stem them. I do this by slicing close to the stem on each side, making two halves. 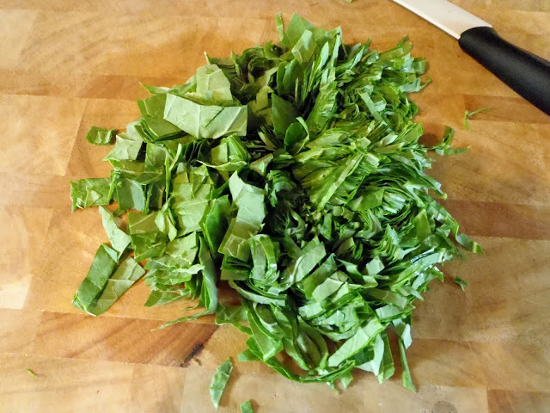 I make a pile out of the collard halves and roll them up nice and tight in order to slice thin strips. You will be able to skip this step if you buy bagged collard greens, which speeds up the prepping process. The recipe says to cut them in 1-inch segments but I find the thinner you cut them, the faster they will cook. I cut most of them very thin, then near the end decided to cut some thicker like I was supposed to. Next, chop some mushrooms and add them to some olive oil in a pan. The recipe calls for two pints of crimini mushrooms, but having no idea what those fancy things are, I used baby portabella, and only a little less than one pint. Saute them with salt and pepper until they start to brown. Meanwhile, have a pot of a half pound of macaroni boiling and cook a little less than you normally would. Don’t tell but I used a little more than a half pound. 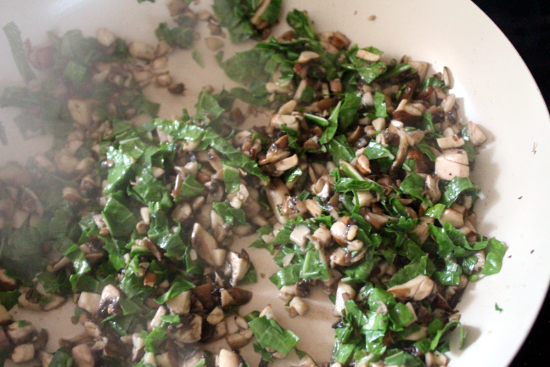 Once the mushrooms have begun browning, add the collards and some more salt. Saute until they are cooked down. The instructions say it takes 20 minutes, but I seemed to accomplish this in less than 10 minutes. You should be looking for something like this. Next thing to do is to make a rue. Melt 4 tablespoons butter in a pot, then add 1/4 cup flour. Stir for a minute, making sure not to burn the flour. I burnt mine while distracted and insisted that I had ruined dinner, but my sweet husband kept reassuring me that I didn’t, telling me it smelled tasty. Add 2 3/4 cup heated milk to the flour and butter, I warmed mine in a small sauce pan while the butter was melting. Stir until the mixture thickens and begins to bubble. I should mention that before or while doing this, make sure to shred your cheese. You will need total 2 1/4 cup of sharp white cheddar (I bought what my grocery store called aged cheddar, and it was obvious that it was white), 3/4 cup of Gruyere, and a 1/2 cup of Parmesan. I went extra fancy and used grated Parmesan and Romano cheese that comes in the bottle, I know, I outdid myself. I enlisted the help of my son Elijah to shred the cheese for me, and Eliana made sure to supervise. Once the base of the sauce thickens, mix in most of your cheese, which will be 1 1/2 cup of the cheddar, a 1/2 cup of Gruyere, and all of the Parmesan, and season with some salt and pepper. The recipe says to add nutmeg and cayenne pepper, but I am not a fan of nutmeg and was very hesitant to make it spicy with cayenne, so I opted out of those spices. The mixture was looking pretty grainy to me, which worried me, but I set my worries aside and hoped for the best. To the cheese mixture add the cooked noodles and sauteed veggies. Spread in a casserole pan and top with the remaining cheese. I guess this is the point where I should tell you about the breadcrumbs. The original recipe calls for 6 slices of “good-quality” bread and 6 tablespoons of melted butter to make breadcrumbs with. I didn’t have any frozen breadcrumbs on hand and I really didn’t want to use the sourdough I just bought from the store, nor did I want to have to clean my blender, (is that so bad of me?) so I ignored that step. Plus, I love macaroni, with or without breadcrumbs, and this dish was just screaming at me for no breadcrumbs! If you choose to add a bread topping, (you could also use saltine crackers like I grew up with) just add them on top of the cheese. Bake for 30 minutes at 375 degrees, until nice and bubbly or until your topping of choice is browned. Then let it rest for 10 minutes. 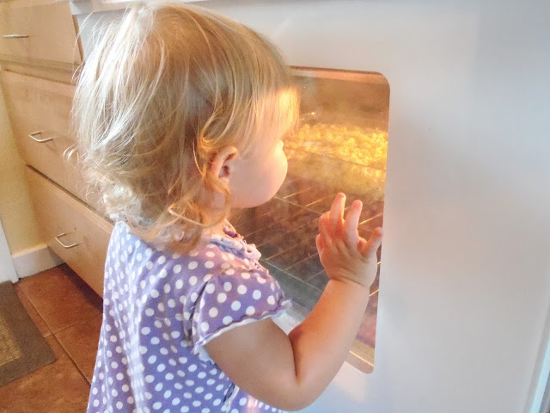 Eliana kept a close eye on it for me to make sure I wouldn’t burn anything else. Our finished product smelled as delicious as it looked. I couldn’t wait to dig in and eat that crispy burnt cheese. Everyone seemed to enjoy it, even the toddler who won’t eat anything that is the color green. Maybe next time I will spice it up with some cayenne pepper, if I am feeling rebellious enough. I would say this is dish is a win in my book. Bring water to boil and cook macaroni 2-3 minutes less than usual. Once almost fully cooked, drain pasta in colander and rinse with cold water. Drain well and set Aside. Heat olive oil on medium high heat in a large skillet. Add mushrooms with salt and pepper and saute until mushrooms have released their moisture and start to brown. Add sliced collard greens and some more salt and saute until greens have cooked down. Set aside. Melt butter in a large sauce pan. When butter is melted and starting to bubble, add flour and stir for a minute. Whisk in milk and continue to stir constantly until mixture becomes thick and bubbles. Remove from heat. Add 1 1/2 cup cheddar, 1/2 cup Gruyere and 1/2 cup Parmesan. Also add salt and pepper and the nutmeg and cayenne if using. 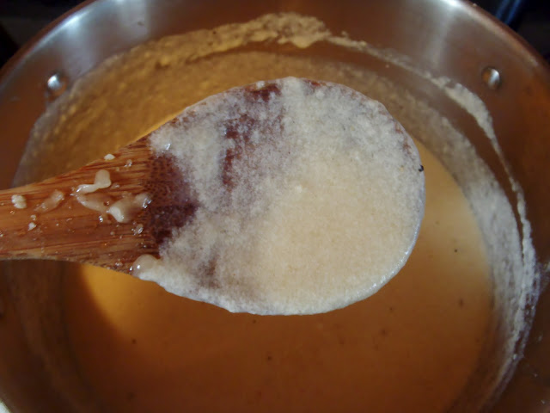 Stir until cheese is melted and thorougly mixed. 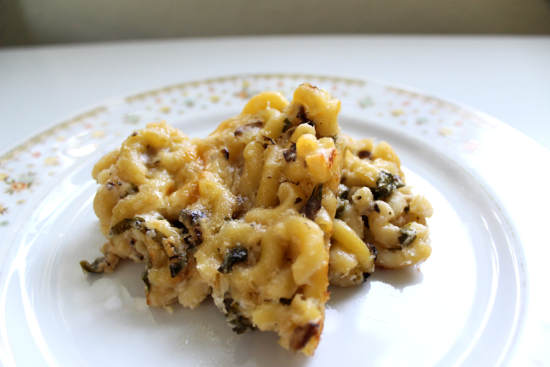 Add macaroni, collard greens and mushrooms to cheese mixture and stir. Pour mixture into casserole dish. Sprinkle with remaining cheese. If using, spread breadcrumbs over the top. Bake for 30 minutes. Once done, let rest for 10 minutes.